China Agrees To Greenhouse Gas Cap; U.S. Will Accelerate Cuts The unexpected breakthrough by the world's two largest polluters reflected both nations' desire to display a united front, and could inspire other reluctant developing countries to follow suit. U.S. President Barack Obama, right, smiles after a group of children waved flags and flowers to cheer him during a welcome ceremony Wednesday with Chinese President Xi Jinping at the Great Hall of the People in Beijing. In a surprise agreement late Tuesday, China agreed to a first-ever target for capping its carbon emissions, while the United States pledge to cut faster than previously planned. The United States and China pledged Wednesday to take ambitious action to limit greenhouse gases, aiming to inject fresh momentum into the global fight against climate change ahead of make-or-break climate talks next year. President Barack Obama announced that the U.S. would move much faster in cutting its levels of pollution. Chinese President Xi Jinping agreed to cap China's emissions in the future — a striking, unprecedented move by a nation that has been reluctant to box itself in on global warming. The unexpected breakthrough by the world's two largest polluters, unveiled on the last day of Obama's trip to China, reflected both nations' desire to display a united front that could blunt arguments from developing countries that have balked at demands that they get serious about global warming. Yet it was unclear how feasible it would be for either country to meet their goals, and Obama's pledge was sure to confront tough opposition from ascendant Republicans in Congress. The U.S. set a new target to reduce its emissions of heat-trapping gases by 26 percent to 28 percent by 2025, compared with 2005 levels. That's a sharp increase from earlier in Obama's presidency, when he pledged to cut emissions by 17 percent by 2020. China, the emissions of which still are growing as it builds new coal plants, didn't commit to cut emissions by a specific amount. 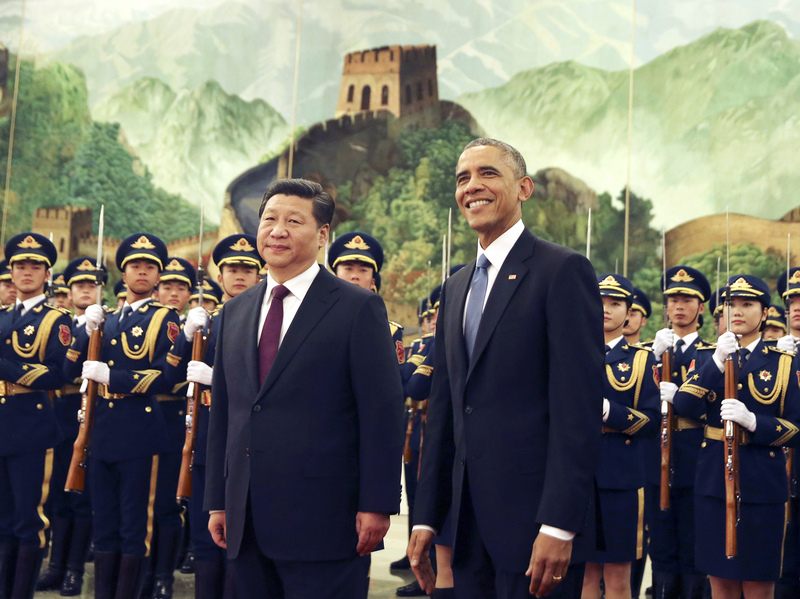 Rather, Xi set a target for China's emission to peak by 2030, or earlier if possible. 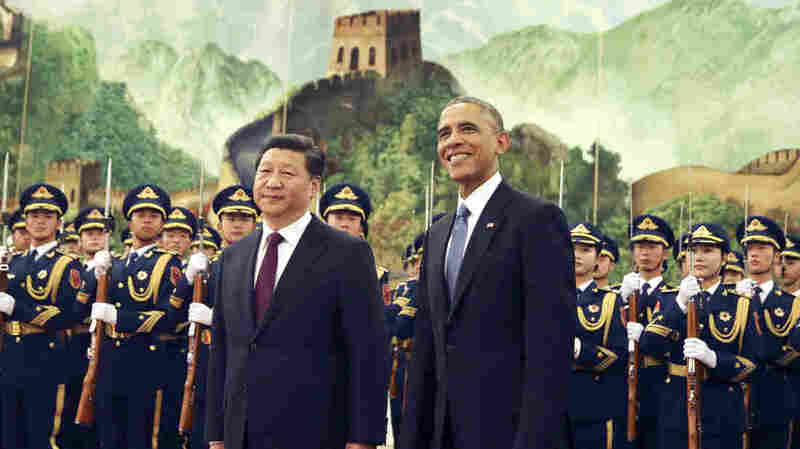 He also pledged to increase the share of energy that China will derive from sources other than fossil fuels. Obama's target, expected to serve as the U.S. contribution to a worldwide treaty to be finalized next year in Paris, came months before it had been expected. The U.S. has sought to show aggressive action on climate change in order to spur other nations to offer ambitious contributions, too. For China, the commitment to cap emissions marked a turning point in China's evolution on global warming and its responsibility to deal with the problem. China accounts for around 30 percent of global emissions, but has only gotten serious in recent years as the large-scale impact on health and quality of life in China has come into focus, exacerbated by smothering smog in Beijing's skies. Environmental advocates in the U.S. heralded the joint announcements as a game-changer that would undermine opposition. If China can get serious about emissions, they said, surely others can, too. "Now there is no longer an excuse for Congress to block action," said Sen. Barbara Boxer, D-Calif., who chairs the Senate's environmental panel. But Republicans signaled that they would seek to thwart Obama's efforts once the GOP controls the Senate next year, pointing out that Obama was saddling future presidents with a tough-to-meet goal. "This unrealistic plan, that the president would dump on his successor, would ensure higher utility rates and far fewer jobs," said incoming Senate Majority Leader Mitch McConnell, R-Ky.